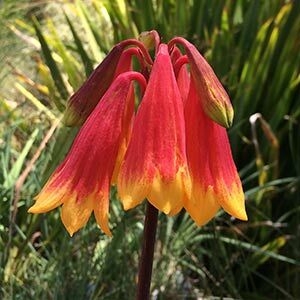 Blandfordia Grandiflora or as they are commonly called ‘Christmas Bells’ are a must for the native garden, in fact they can be grown in any style of garden as well as containers. Large flowers heads held high on stalks nearly 1m high. With up to 20 flowers on a stalk they make a fantastic display and they are from the lily family. 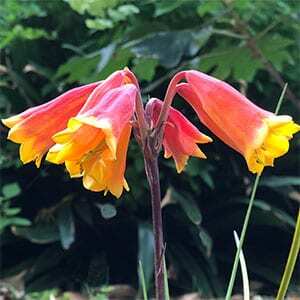 These are one of the truly wonderful Australian flowering plants, brilliant flowers and can be planted either individually or in small clumps. Give them a little space in-between tubers so that the large flowers can be shown off to their fullest. Widely grown commercially as a cut flower and unfortunately a little endangered in its native habitat due to land clearing. They can also be grown in containers, use a largish deep pot and a good quality potting mix. These are a clump forming plant that grow not from a bulb, but from tuberous root system. They require good drainage as well as some moisture. Appearing as a tufted perennial found naturally in damp conditions in heathlands from Queensland through to New south Wales. In most gardens they are best grown in containers or large pots where moisture and drainage can be controlled. This will also help protect the flowers, and stop competition with weeds and other larger plants. Try growing them in a mixture of peat, or composted sawdust fine and coarse clean sand. The ideal conditions are sunny with consistent moisture, so maybe a hollow at the lower part of a garden slope where natural moisture occurs, however not water logged areas. Pictured right (lower) is a specimen growing in our own garden. The easiest method of propagation is by root division of established clumps. It is also possible from fresh seed, and germination rates can be high. Initial growth is slow as plants establish a root system. From seed the plant will take around 3 – 4 years to flower although germination usually takes place in 2 – 3 weeks. Propagation by division of rhizomes is also possible and this usually provides flowers the same year. Origins – NSW to QLD. Soil – Well drained, humus rich sandy moist soils. Spread – Forms a clump to around .3 metres. Growth rate – Slow from seed. Flowers – Orange/Yellow and Red. Frost tolerant – Very mild frosts only. Drought tolerant – No, they require moisture over spring and summer. All are from the lily family and are tough attractive flowering plants well suited to the rock garden. B. grandiflora flowers are commonly red and yellow, however some forms having pure yellow flowers. B. nobilis is from the coastal areas of southern New south Wales with small colonies in eastern Victoria. B. punicea which is from Tasmania.